Public (or private) modules are available as separate repositories (projects) within GitLab or GitHub. They can then be included in any other projects through Composer. For more information about Composer usage with SilverStripe see Installing and Upgrading with Composer. We assume here that you have your website project already started, based off the basic recipe. Note: Both your main project (the website) and each of the modules have their own repositories. The main project is special in the sense that it has its own code and also pulls in other modules and places them in its root. Create a new directory named after your intended module in your main project. It should sit alongside the other modules such as framework and cms and use it for the module development. This will allow you to work with the module straight away, without the need to commit to the repository at all. General documentation on module creation is available here - Module Development. Don't forget to create the _config.php file, even if it only contains the PHP header (<?php[newline]). Follow the conventions established by other modules like the cms so it's easier for other developers to work with your code! Please change the module name and namespace. The first part of the "name" in the composer.json file constitutes a namespace - please use the same namespace that you are using in Gitlab, to distinguish between the officially supported CWP modules (that reside in the "cwp" namespace) and private modules. After your module is running and tested, you can publish it. Since your module is a self-contained piece of software, it will constitute a project in itself. From your module directory follow the instructions at Creating repositories. Once the module is pushed to the repository you should see the code on Gitlab. From now on it will be available for others to clone, as long as they have at least a "Reporter" level access (see the note below though: private modules are not deployable). Check out instructions at Sharing repositories on how to control module access settings. To include a new Packagist-based module in your project, such as silverstripe-blog, follow the instructions in the chapter Adding modules to your project. Including public or private repositories that are not indexed on Packagist is different. This means we will need to point composer to specific URLs. Background information can be found at Working with project forks and unreleased modules. For our foobar example module we have just pushed upstream add the following lines to your composer.json file in the root directory of your main project. The private parameter is non-standard and is used by Dashboard to distinguish between private repositories and public repositories. See the section below about public modules. To include a private GitHub hosted module, for our foobar module pushed to an upstream GitHub repository, add the following lines to your composer.json file in the root directory of your main project. The no-api parameter prevents API usage which will remove the need for an API token from the CWP deployment systems. Add the module directory name (foobar/) to .gitignore - we will rely on the composer to update the dependencies so we don't need to version-control it through the master repository. Run composer update to pull the module in and update all other dependencies as well. You can also update just this one module by calling composer update <modulename>. If you get cryptic composer errors it's worth checking that your module code is fully pushed. This is because composer can only access the code you have actually pushed to the upstream repository and it may be trying to use the stale versions of the files. Also, update composer regularly (composer self-update). You can also try deleting Composer cache: rm -fr ~/.composer/cache. Finally, commit the the modified composer.json, composer.lock and .gitignore files to the repository. The composer.lock serves as a snapshot marker for the dependencies - other developers will be able to composer install exactly the version of the modules you have used in your project, as well as the correct version will be used for the deployment. Some additional information is available in the Deploying projects with composer. If you decide to include private modules in your website project (also your own private repositories), Dashboard will need a permission to access them. 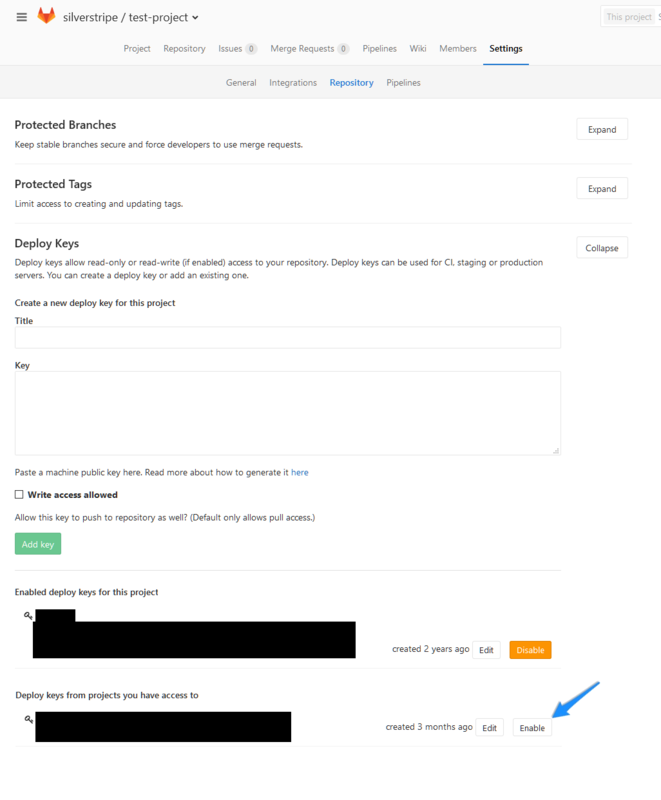 If you already have your repository associated with the stack you will be deploying to, the only thing you need to do is to enable the project key on the module as shown on the image below. The key is named after your stack identifier. You will only see the deployment key if you are the owner of the repository. See deploying code for more information. Also, double check that your project's composer.json specifies the "private" parameter for all private repositories as shown in the "Including a module in your project" section. You can allow anybody on the internet to access your module and include it in their projects (which could be the case if you have decided to open-source your module). To do so you need to be the owner of the repository. Appropriate checkbox will then be available to you in the project settings. Inside settings, choose the correct "Visibility Level" and click "Save changes"